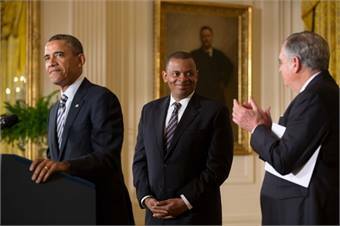 WASHINGTON, D.C. — President Barack Obama nominated Charlotte, N.C. Mayor Anthony Foxx to replace Ray LaHood as secretary of transportation according to several sources, including the New York Times. When making the announcement, the president also used the opportunity to prod Congress to provide billions of dollars for improving the nation’s transportation infrastructure. He said the Administration’s top priority was strengthening the economy and providing more jobs for people. Mayor Foxx, the current chair of the Metropolitan Transit Commission, successfully led efforts to advance regional transportation initiatives including breaking ground on the streetcar project and a third runway at Charlotte-Douglas International Airport and securing $1 billion in funding to extend the LYNX Blue Line to the University of North Carolina at Charlotte. For the full story, click here. Foxx received a law degree from New York University’s School of Law as a Root-Tilden Scholar, the University’s prestigious public service scholarship, and earned a bachelor’s degree in History from Davidson College. He is a member of the Mecklenburg County Bar and a graduate of its Leadership Institute. Prior to joining the DesignLine Corp. as Deputy General Counsel in 2009, Foxx was an attorney at Hunton & Williams law firm. He also served as a law clerk for the United States Sixth Circuit Court of Appeals, a trial attorney for the Civil Rights Division of the United States Department of Justice, and staff counsel to the United States House of Representatives Committee on the Judiciary. “Mayor Foxx has been a strong advocate for public transportation in Charlotte, and as a local mayor, he understands the critical role public transit plays in the economic vitality of our communities — and the importance of a strong local, state and federal partnership in infrastructure investment,” said American Public Transportation Association President/CEO Michael Melaniphy. “I am pleased the President has put forward a candidate to lead the U.S. Department of Transportation, and I congratulate Mayor Foxx upon his nomination. Transportation is important for our country. These issues are about jobs, quality of life, and prosperity. I remain committed to building consensus about how to strengthen our infrastructure, promote economic growth, and make the Nation more competitive in the global marketplace. Once he has been confirmed by the Senate, I look forward to working with Mayor Foxx to achieve these goals for our country.